Sanctuary and crew made our first transit between Manteo and Ocracoke across Pamlico Sound on Monday, 10/25/2010. This route is 20 miles shorter than the ICW route from Coinjock, VA, to Oriental, NC, but it is greatly more exposed to open water. The portion of the Pamlico Sound crossing that is in truly “open water” is about 35 StM, so pay particular attention to the marine forecast when you go. That said, Manteo and Ocracoke are neat little towns, and we learned things here that we never knew. 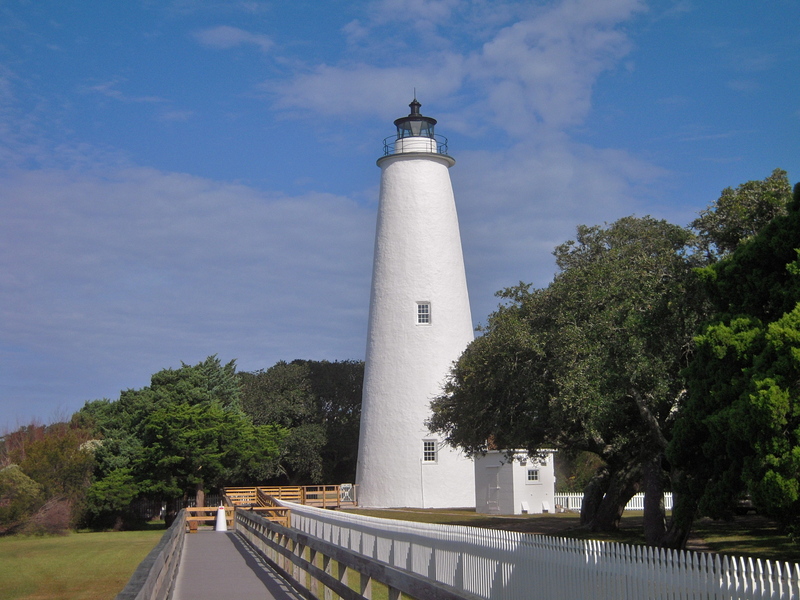 Visit the Roanoak Island Maritime Museum and The Lost Colony. This is a really excellent alternative to the ICW and the Alligator River, Alligator River Swing Bridge, and Alligator-Pungo Canal. The following screen capture shows the A-ICW route on the left of the page, and the Pamlico Sound route between the Albemarle Sound and Oriental, NC. Traveling southbound, we got to Manteo by crossing the Albemarle Sound from Elizabeth City to Croatan Sound. No problems; unremarkable navigation except for the trillions (exaggeration for effect) of crab pot floats in the Albemarle. From the Albemarle, we took the Croatan Sound Channel to the north end of Roanoke Island, and then turned east through the buoy-marked traverse across the north end of Roanoke Island through Roanoke Sound, to the Roanoke Channel. 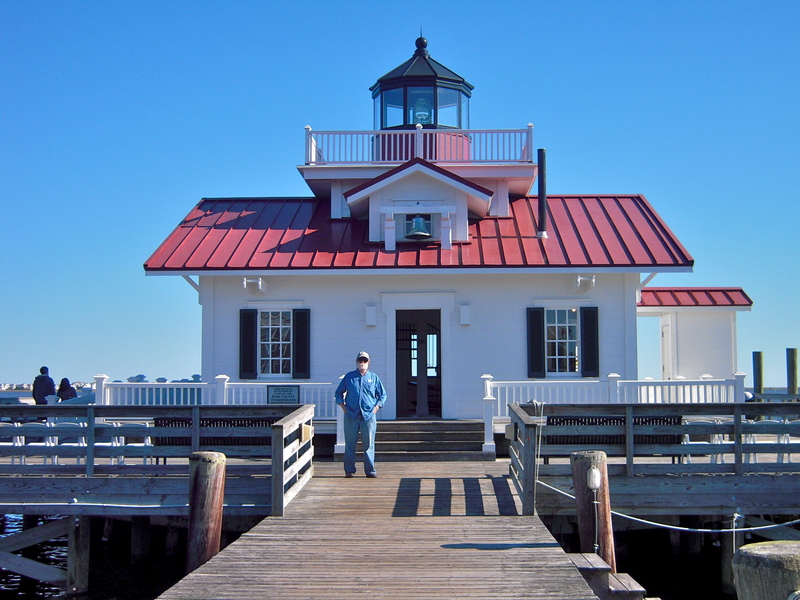 We stayed at Manteo, at the Waterfront Marina; an excellent facility and staff. When we departed from Waterfront Marina in Manteo, we turned south into the Roanoke Channel through Roanoke Sound, joined the Old House Channel into Pamlico Sound, southwest across the Pamlico to the Big Foot Slough Channel into Ocracoke Island’s Silver Lake, and to the National Park Service docks. This is a transit of 67.1 StM which we did in 8.26 hours (so an average speed of 8.12 Stm/hr). Here’s a synopsis of the navigation between Manteo and Ocracoke. The Roanoke Channel, from it’s beginnings north of Manteo, carries as little as 7ft to it’s intersection with the Manteo Village entrance channel. South of the Manteo entrance channel, the Roanoke Channel carries at least 9′ for it’s entire length; in most areas, 11′ to 14′. There are no draft-related problem areas (at this time). In fact, the reproduction s/v Elizabeth II, which draws 8 ft, regularly uses this channel. So, no draft problems, but the channel is quite narrow, probably 100 ft. And, it is not a “No Wake” area. Thus, our plan was to “take our half out of the middle,” which was OK at 07h00 on a Monday morning. There were, however, two areas that caused me some navigation confusion. A couple of miles south of Manteo is the US64/US264, 65′ fixed bridge. Southbound, emerging from under that bridge, there is a square “No Wake” sign on a post just on the east side of the channel. With the sun low on the morning horizon, I nearly mistook that sign, by shape, for a green marker. It’s not. The second area of confusion was another 2 – 3 miles south of the aforementioned US64/US264 bridge, where there is a side-channel that runs off to the west, into the village of Wanchese (pronounced: WAN-cheese). In that area, when southbound, the Roanoke Channel takes a small dog-leg left, and then another, back to the right. It took me a minute looking through the binoculars to actually realize there was a side-channel intersection there, and it was confusing; and narrow. Carefully pick out the markers for the Roanoke Channel. At it’s south end, the Roanoke Channel turns sharply west. In another mile, it intersects with the Old House Channel where the Oregon Inlet Channel comes in from the ocean. My understanding is, the Oregon Inlet channel is now closed (fallout from Hurricane Sandy). Verify before planning to use. There are several new markers on the Roanoke Channel that are not mentioned in the cruising guides and are only reflected on electronic charts that have recent Local Notices to Mariners (LNMs) incorporated. On the Roanoke channel, the new markers include 37A, 37, 36A, 36, 34A and 34. At the entrance of the Old House Channel (which is just a continuation of the route from the Roanoke Channel into Pamlico Sound) there is a new green-over-red marker, “OH.” The rest of the Old House route into Pamlico Sound is well marked and unremarkable. 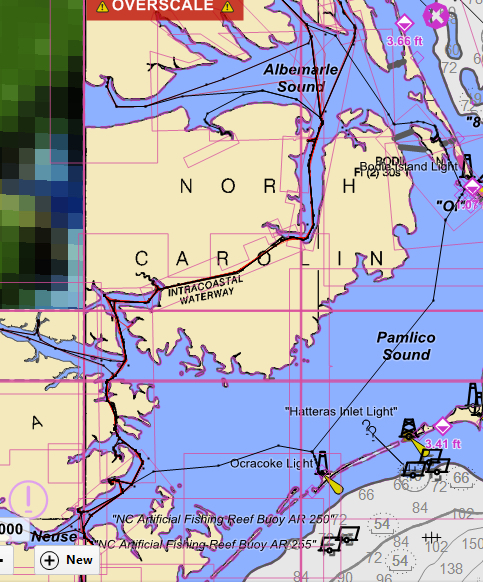 The route across Pamlico Sound is, likewise, unremarkable. Follow it to the Big Foot Slough Channel from the sound into Ocracoke. Note here that the North Carolina State Ferry System uses this channel. Draft for pleasure craft is not a problem, but if you encounter a ferry in that channel, watch the prop wash! The prop wash is very, very strong, and definitely enough to set you out of the channel. There is a red-over-green junction marker just beyond R3 and G4. Watch for the correctly charted shoal there, and turn 120 degrees or so to port, into the entrance channel into Ocracoke harbor, called “Sliver Lake” on the charts. In the harbor, inexpensive dockage with water and electric is available at the National Park Service docks adjacent to the ferry docks. In this harbor, there is also plenty of room to anchor; 20 boats or more. The harbor is very well protected from the strong periodic winds that frequent this island 20 miles into the Atlantic. This entry was posted in Pamlico Sound on 2013/01/11 by gilwellbear.